50% of the psyche drugs need 2D6 to metabolize, those who are found to be poor metabolizers, missing 2D6 should not be vaccinated The interesting thing I found was that the glutathione pathway implicated in vaccine injury/ Autism Spectrum is found on the same cytochrome 450. Vaccines are so toxic that if someone is a poor metabolizer they will sustain a vaccine injury; then get misdiagosed as ADHD, ADD, etc and then given harmful life debilitating drugs. Weber GF et al. Glutathione peroxidase deficiency and childhood seizures 4 children with intractable seizures, repeated infections, and intolerance to anticonvulsants had evidence of glutathione peroxidase deficiency. 2 had low intracellular enzyme activity but normal blood selenium and high plasma glutathione peroxidase concentrations. The other 2 had low intracellular glutathione peroxidase activity with low circulating glutathione peroxidase and selenium concentrations. The clinical state of the children improved after discontinuation of anticonvulsant medication and selenium substitution. Conference Presentations: Elizabeth Mumper, M.D. 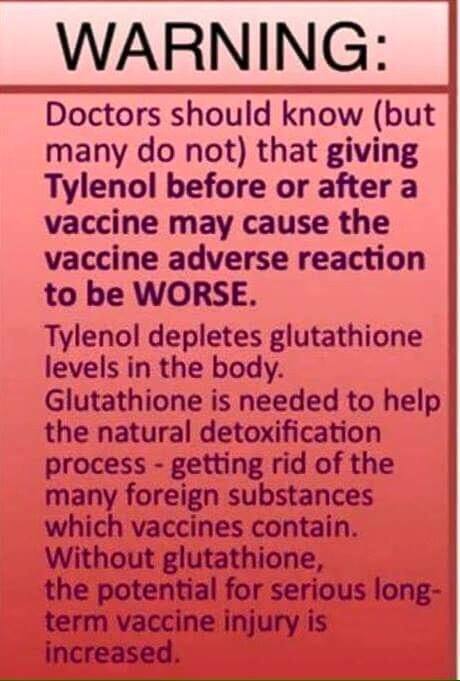 free glutamic acid which is found in EVERY VACCINE in the US, affects the formation of glutathione - which one of the genes for ASD codes for. Glutathione gets rid of mercury from any source. The mercury doesn't have to be in the vaccine for vaccines to cause heavy metal injury. That is why you all have to get off your thimerosol high horse to get at the truth. The vaccines cause heavy metal injury even when the vaccines DON'T have mercury in them...The vaccines cause heavy metal injury even when the vaccines DON'T have mercury in them. IACC meeting by Carol Hoernlein, P.E. This is a child who was born healthy, had colic, lots of fever and swelling after his vaccines, and hives after he got his immunizations. He went on to regress into autism. The thing that really kicked him over the edge seemed to be his pre-kindergarten booster vaccinations. He had started doing better developmentally and then he was "never the same again" after he received MMR, DPT, and IPV on the same day. Physicians, please do not give the second MMR at kindergarten to children in the autism spectrum. In this country it is given to every child because five percent of the kids do not develop enough antibodies after one dose. This shows the challenge/re-challenge phenomenon, where if you give autistic patients the second MMR, there's an increase in acute inflammation and epithelial changes in a significant number of patients versus controls. I recommend that you consider preloading prior to vaccines with certain things like vitamin A and other antioxidants. Please do not give live viral vaccines when the children are sick or on antibiotics or have diarrhea. Conference Presentations: Elizabeth Mumper, M.D.